I've been wishing for a Wobble Ball from Pets Lifestyle And You since I first saw it on their website two years ago, and they gave me a Wobble Ball 2.0 at SuperZoo! This puzzle toy definitely takes the cake for aesthetics, it seriously looks like a tastefully classic baby toy. Remember those spinning tops from Germany, with ballerinas or airplanes or circuses whirling around under a clear dome? It's just so pretty! Inside the dome is a little dog in a play bow, with a pumpkin and a carrot in a little field or garden. They don't spin, but they do look adorable under the cloud-shaped openings in the dome. Version 2.0 added matching soft linings around the openings. Did I mention it also holds food, in addition to being adorable? Each of the three openings is a different size, so it might drop a little bit of food or a lot each time. 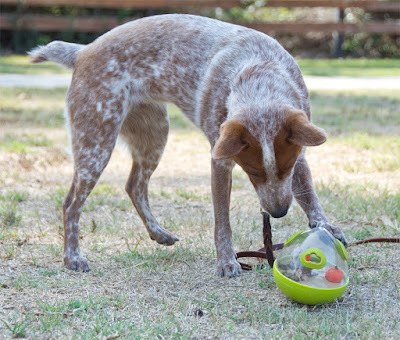 The whole thing comes apart into three pieces, and the base can conveniently be used to hold extra treats. It is worth noting that this is an interactive toy that requires supervision. It is not a chew toy, and should not be gnawed. I found a couple of reports of dogs getting their lower canine teeth caught in the previous version of the ball, happily the design has been updated. It's not really intended as a meal feeder, but I can put at least a cup of food in here. Unscrew the dome, add food, screw it back on. Just make sure the middle piece with the figures is sitting properly in the base, otherwise the dome won't go on straight. 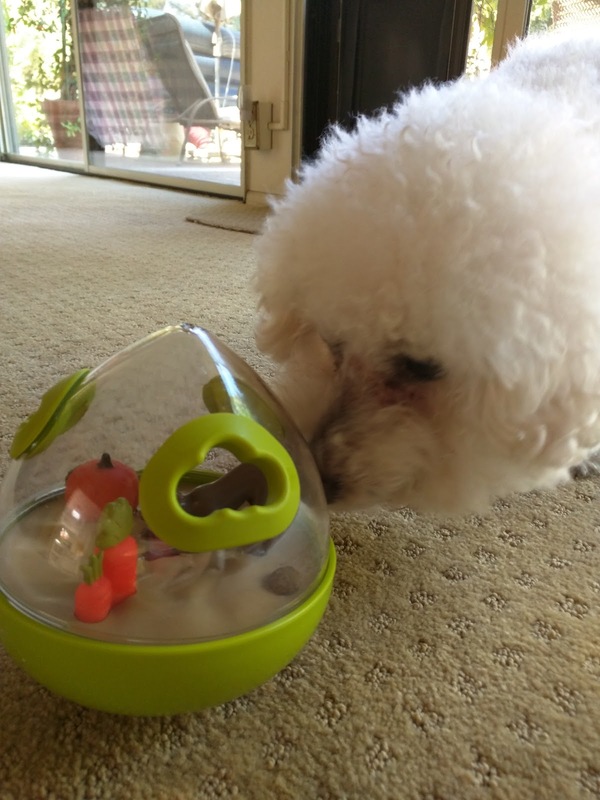 I put half a dozen little treats in here for Ozzie the Bichon, who had never seen this type of puzzle toy before. He spent an entire afternoon figuring out how it worked. It's not super obvious, but the little figures under the dome do more than just look pastoral and adorable. They also catch the food as it rattles around, making it difficult to get it all out just by batting it around wildly. The Wobble Ball 2.0 manages to drop food at a sufficiently high rate to keep the dogs interested, without dumping more than a couple of kibbles at a time. It's an impressive combination of form and function. I had thought the base would be weighted, but it's actually empty so the toy is very lightweight. At the same time, it's very sturdy. The Wobble Ball is light enough for little tiny dogs to play with, but big and strong enough to allow giant breeds to play safely. It's not a chew toy, but I'm confident I could drop this thing down a flight of concrete steps without hurting it. The clear dome is holding up remarkably well too, I was expecting it to get scratched up right away and it looks pristine. It's hard plastic so it makes a bit of noise on the hard floors. However, the design means it doesn't roll very far. It's not super heavy or super resonant, either. It only rolls a little bit, doesn't fit under the furniture, and is too big for my dogs to pick up and carry. Comes into three pieces for easy washing, with no cracks or crud-collecting spots. It's dishwasher safe too! The combination of light, durable, and difficult makes this a toy I could use for a variety of animals. Rats, bunnies, and guinea pigs could all roll it around without getting squished. Xhuuya the raven might also like it, but she's likely to either unscrew it or just bash it against a rock, so I don't think I'll let her try ours.